These days, skin gadgets are getting more and more popular. Some help cleanse the skin while some even use light to repair and renew our skin cells. 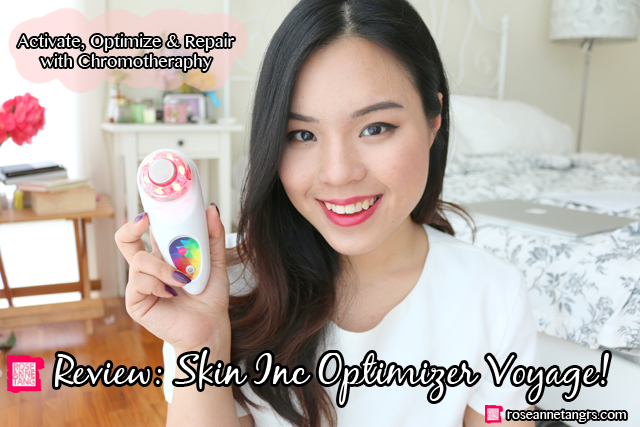 Today, I’ll be doing a review on a new home spa device – the Skin Inc Optimizer Voyage! 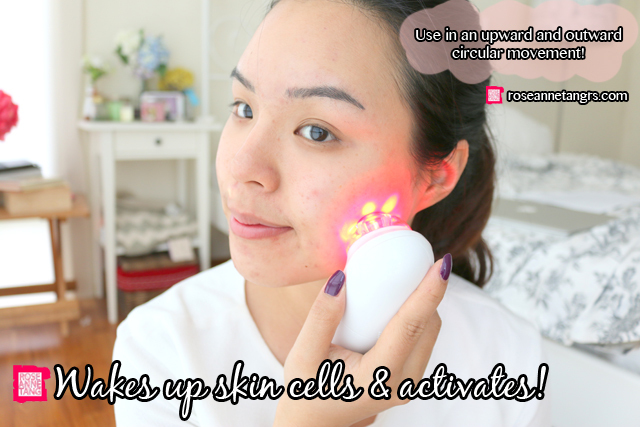 I’ve always been entralled by light technology for skincare. 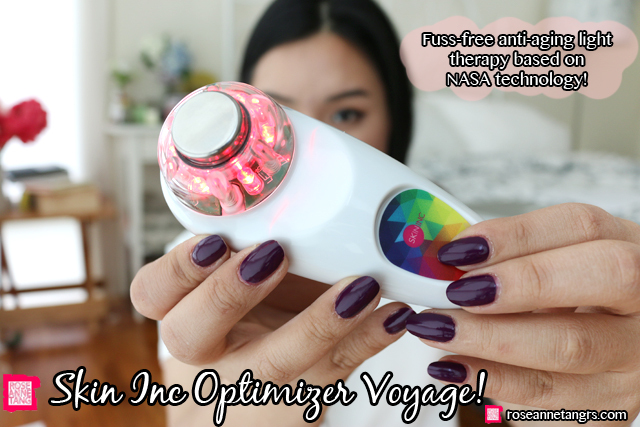 The Optimizer Voyage specially uses LED Chromotherapy and Low Frequency Current Stimulation to wake up skin cells and enhance the absorption of active ingredients in skincare products. This research is based on NASA technology and provides Skin Inc with a new fuss free anti-ageing light therapy that we can now use everyday at home. Skin Inc previously came out with the Skin Inc Optimizer that provides three wavelengths of light therapy (the red, blue and green). However, the Optimizer Voyage is the mini version of that device and provides only the anti-ageing red light therapy (which happens to be the most popular of the three). In fact, it’s small size makes it a great choice for time-starved urbanites who want to see visible results in as quickly as 10 minutes. It’s also small enough to pack in any bag and is battery operated so that you can bring it on the go. The Optimizer Voyage serves a couple of functions. 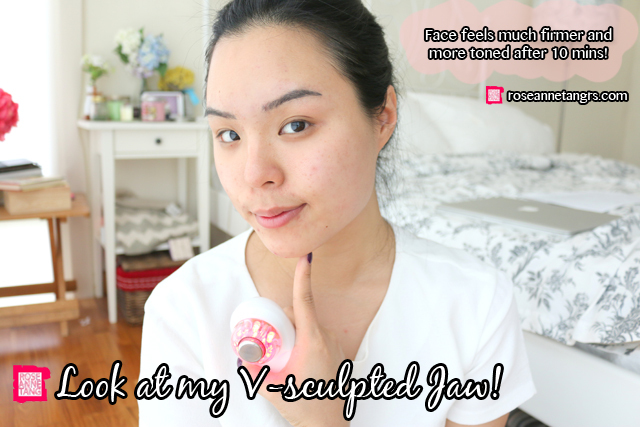 The first being that it can help you create a V-sculpted face and reduce puffiness around the jaw area so that you can attain the coveted v-shaped jawline. Secondly, it helps to activate your cells to produce more collagen and elastin – these are lacking when you age leading to sagging and wrinkly skin. The Optimizer Voyage uses chromotherapy to combat this so that cells will produce more collagen and elastin. The Optimizer Voyage also optimizes the absorption of your skincare products – research suggests that we only absorb about 40% of the active ingredients we apply but the optimizer increases the absorption rate to about 90%! Last of all – it helps to renew and repair damaged skin cells. 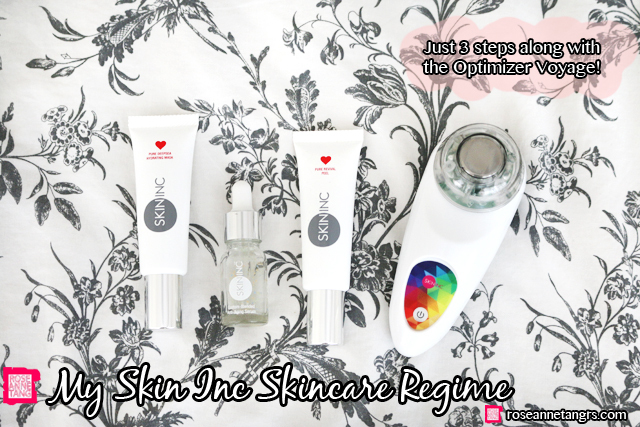 The Optimizer Voyage will achieve best results when used with Skin Inc’s fuss free signature 3-step regime. For a few days, I used this in conjuction with the Optimizer Voyage and I was pretty pleased with the results. So here goes! 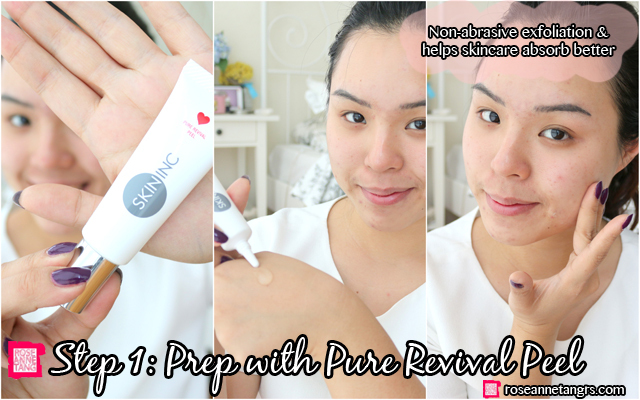 Firstly, I used the Skin Inc Pure Revival Peel to prep my skin. It’s a non-abrasive peel that gently removes dullness and dead skin cells. It also maximizes the absorption of nutrients from daily skincare products and reveals luminous skin. It comes out as a clear gel, not milky as start. Apply peel and leave a thin layer on te face for 20-30 seconds and start massaging face once gel starts to turn milky, small little beads form – from the product itself and your dead skin cells. These beads help to exfoliate the skin. I like it because it doesn’t feel rough and my skin feels very soft after doing the peel. Next, apply your serums. Skin Inc is known for their skin supplement bar and the ability to custom blend your skincare. These serums look like vials of little small colored capsules suspeneded in a clear liquid. Each color actually represents a different nutrient – whether it be hyaluronic acid, vitamin C or vitamin A. Because they are capsules, you can mix all the different colors together as the capsules will not mix together until they are “crushed” when you apply and press them into the skin. 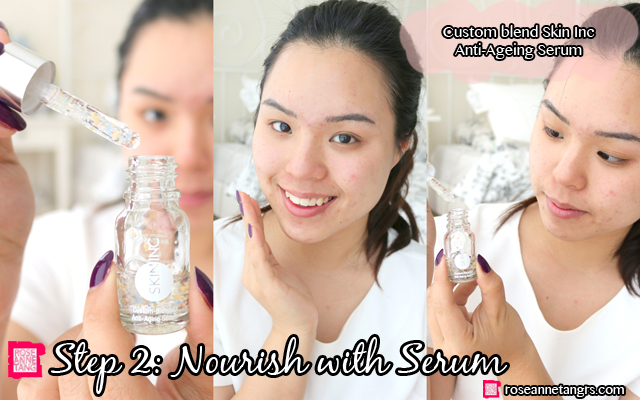 The one I’m using is the custom blend of anti-ageing serum – it includes Coenzyme 10, hyaluronic acid and collagen. I really love this concept to be honest. You can see all the colored dots and you really know what your skin needs. The clear liquid is mainly made of glycerin. Serums and encapsulated in a seaweed envelope I want to get myself the Daily Dose one day, when I can mix my own. I reckon I’d want licorice which helps with acne, vitamin c and ceramide! 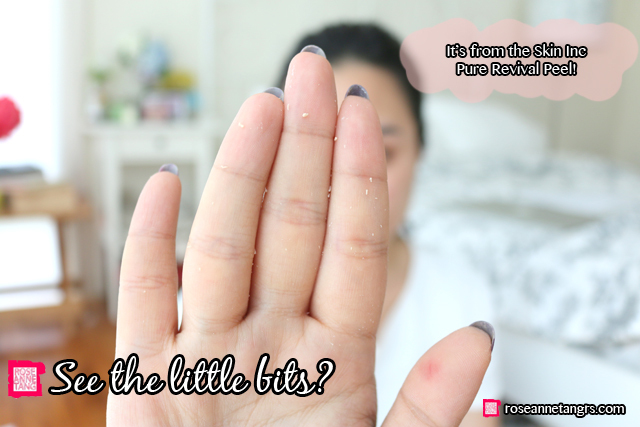 Back on topic – when applied on the skin, it absorbs really well. There’s no after feeling whatsoever and dries natural. The Optimizer Voyage will actually serve to massage the skin so you need a product that helps it to glide better. 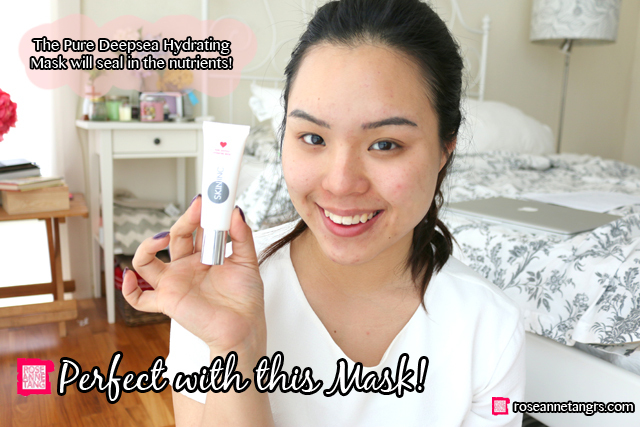 For this, I used the Skin Inc Pure Deepsea Hydrating Mask. Other than making a great glider, the mask is a transparent gel mask that hydrates, clarifies and brightens the skin in a single step. You don’t have to rinse it off and it does not have a sticky finish which is great. 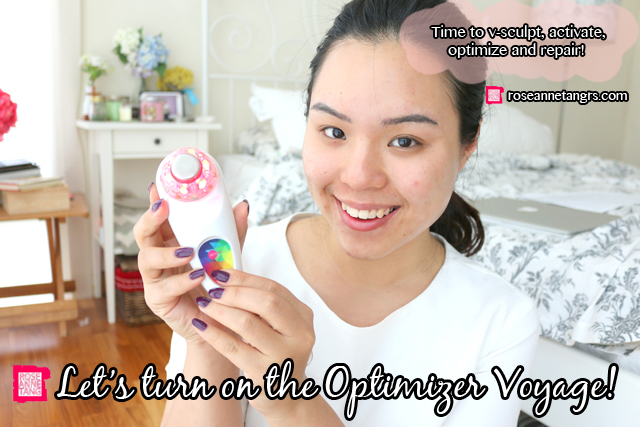 Finally, it’s time to show you how I use my Optimizer Voyage! I have to say that this device is super easy to use because it fits easily into the palm of my hand and the small probe allows it to concentrate on specific facial parts. Just press the on button and you’re ready to go! It will emit a red light which is a scientifically tested low frequency current which is designed to boost and increase the metabolism of skin cells while also increasing blood circulation. It helps to enhance the penetration of skincare ingredients and can be used twice daily for up to 10 minutes. There is also an in built timer that shuts off the device after about 10 minutes. I was to be honest quite skeptical of this before I tried it out. I mean, how can light make my cheeks slimmer. I was wrong though and it really did help me firm up my cheeks. The light it emits I know isn’t normal light. In fact, there’s a clicking sound to it (I think it has something to do with frequency) and it is slightly warm. After applying the deepsea mask, I massage it upwards, especially around my chin area. The results were pretty amazing. After 10 minutes, my chin really felt much smaller and my face was a lot more toned and firmer. There was a slight warm sensation to it from I think the increase in blood circulation. I tried not using it for a few days even to see a difference and my skin was not as firm as to when I used it. Overall, it’s something amazing to check-out if you are thinking of getting an anti-ageing device. I do recommend you check this out! Thanks so much to Skin Inc for letting me try this amazing device! The Optimiser device was launched (worldwide) and sold executively at Sephora Singapore on Jan 8th until Feb 4th. Introductory price is $268 and exclusive for Sephora ION, customers can enjoy exclusive bundles of the optimiser with star products of peels and masks for only $298.